These are the ingredients for traditional Okonomiyaki. Many people are squeamish about handling squid. If this is you, please feel free to sub out the squid for more pork. You can always use shrimp, scallops, octopus, sliced ham or bacon. Start out by washing and slicing your cabbage. Set to the side in a bowl. Pour the flour, chicken stock granules, bonito flakes and salt into a bowl and mix together with a fork. Pour in your water and mix well till there are no lumps left. Grate the yam or potato. Pour it into the mixture. Finely slice the scallion. Cut the pork and squid up and mix all three items into the batter and mix well. Finally, add in the panko or tempura flakes and eggs to the batter. Mix it in, but don’t mix until smooth. Just enough to start to blend everything together and break the yolks. Begin to heat your frying pan and coat it with some non-stick spray or oil. Once the pan is heated, pour in about 1/3 of the batter. Cook for about 7-5 minutes until it starts to turn golden brown. 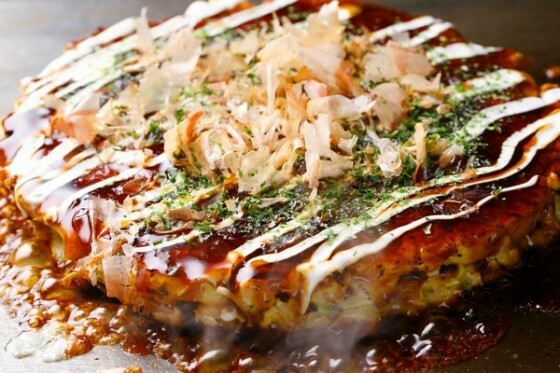 Flip the okonomiyaki over and cook for another 5-7 minutes until FULLY COOKED THROUGH. 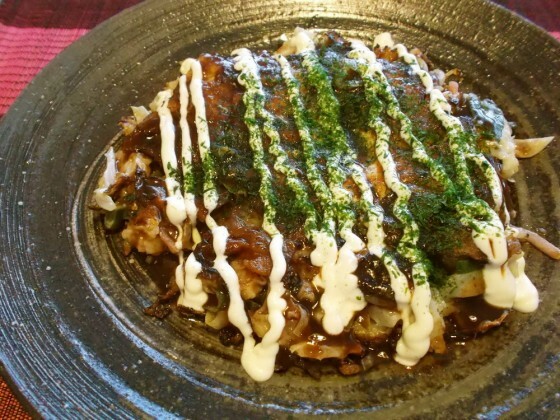 Cook the remaining two-thirds of the batter to make two more okonomiyaki. Top with the Japanese Worcestershire Sauce, followed by mayonnaise in a lattice. Top this with the bonito flakes and aonori.